Colin H. Leight Jr. was born on January 24, 1999. He was a preemie weighing only 3 lbs 14oz. Despite being a preemie, he was in good health and needed very little assistance from the NICU. Colin was allowed to go home after only 10 days in the hospital. 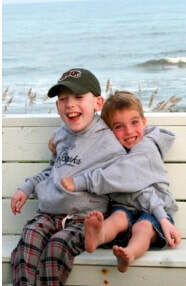 When Colin was about 3-4 months old he began having seizures. In the beginning, he was experiencing a seizure once every few days. The doctor put Colin on Phenobarbital and the seizures progressively got worse. By the time he started the diet, he was having up to 150 “episodes” a day. Our diagnosis road began April 1999 and the roller coaster ended in October of that year, when Colin was diagnosed with Glut-1 DS, an extremely rare condition. At the time of his diagnosis, there were only 11 known cases in the world. The doctors told us that there is no cure to fix this condition but, there was a treatment. The treatment is the Ketogenic Diet. The hope is to be on the diet and have good seizure control without the aid of medication. The diet is also to help his brain grow and to not be deprived of energy. Colin started the diet on October 29, 1999 at St. Christopher’s Hospital in Philadelphia. We saw immediate results. From 150 seizures to Zero! Colin came home from the hospital, He was doing very well. They took him off the medicine and we focused on the Ketogenic diet. Early interventions stepped in to help with physical, cognitive and speech therapies in the home until Colin started school on Jan 25, 2003. Colin was reaching milestones of sitting, crawling, walking and babbling. He was a very happy boy. During, the winter of 2004, when he was just 5, Colin had malrotation of his intestines and needed major surgery to correct this issue. The recovery was long. Colin was given a G-Tube placement in his abdomen. He started to be able to eat solids 3 weeks after the surgery. He was not happy about it. He fought eating all of the time. Due to the complexity of the diet, the Dr. suggested we use the Keto formula. This would help while he was trying to regain the ability to eat again. Colin is still currently on the formula and tube fed. He never regained the ability to eat foods by mouth. In 2010, Colin was doing well but having a difficult time with everything. He could not communicate any of his needs. This was frustrating for him and he would act out when he was not happy. The doctors started to do lots of testing to see if they could pin point what was wrong and why he was upset. Sometimes he would cry for hours. After 8-10 months of testing, Colin was diagnosed with ICP. This is intracranial pressure that acts as if a tumor is in the brain. (Never documented or diagnosed in a child with Glut1) A Spinal tap was done to relive the pressure and the results were immediate. My happy boy was back again. In 2012, Due to his fragile bones, Colin broke his ankle while getting off the bus. This recovery was very long and immobilized Colin for some time. This was also the time he was going through puberty. During his recovery, he was in a wheelchair for almost a year. This set him back a lot. I believe with each medical issue we regressed as if we had never made any progress. He stopped doing many things he was doing in the past and began to just sit and not do anything. This was a very hard time for him. In 2013, Colin was diagnosed with Scoliosis. His spine and hips were turning and it made it difficult for his to walk. We pushed forward and continue to do physical therapy to get him mobile again. By 2014, he was walking but, only short distances and was still struggling as, his body was much bigger. In 2015, Oh no not again!! Colin was screaming and in pain a lot. Holding his head and covering his eyes. Instead of doing a full work up of tests, I asked the Dr. to just do the spinal tap to check the pressure of the brain fluid since, ICP is reoccurring. Sure enough, ICP again. Once the pressure was released he was back to normal. We are praying ICP does not return. If it does he will need a Shunt inserted to prevent future ICP occurrences. By 2016, Colin was also diagnosed with Kyphosis which is a hunch in his back. He struggled walking and standing upright. The doctors informed us that his bone deformities would continue until he was done growing. Still, he continued to be a happy boy and worked hard to get back walking without the aide of a wheelchair or walker. Now in 2018, Colin is healthy and happy most of the time. He is 19!! We had a huge birthday bash for his 18th birthday and he loved every minute. He started a new school and receives in home behavioral therapy which he is making so many strides. He currently is still functioning on a 2 year old level. He needs assistance in bathing, toileting, feeding, dressing and all basic self-help skills. He rarely sleeps normal hours. We find Melatonin, a sound machine and a weighted blanket work well for him to sleep but, he still has nights of no sleep and headaches. He is non-verbal and still struggles to grasp a form of communication. He can answer some questions with picture exchange but still has no real communication and would not be able to communicate in the outside world. He has balance issues, walks dragging his foot and cannot stand upright. But, he is still walking! Colin, is able to follow one step directions. He loves to watch his siblings play outside and go on the swings. He loves movies, music and anything that lights up or spins! We went through guardianship for Colin and have made many preparations for his life as an adult. 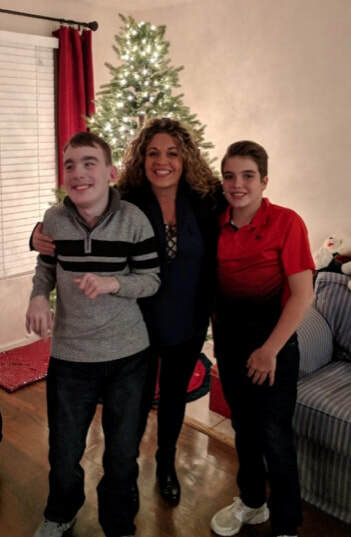 Our Family has made many advances in the care for Colin and we will continue to do whatever we can to ensure he will have a life full of love, happiness and good health. 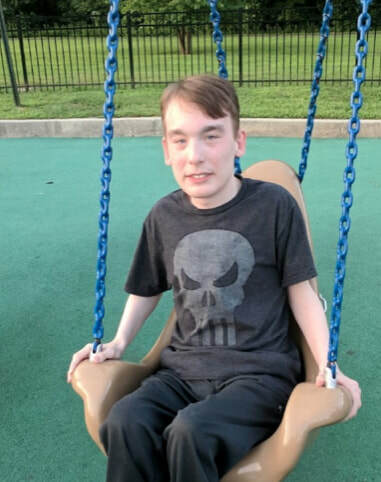 We hope for one day to see the cure for this disorder but, we do know Colin’s case is on the more severe side of the spectrum. He has always maintained good seizure control and for this we are thankful.